CKCA President Mike Slobodian speaks to the group at Interfonction. The Canadian Kitchen Cabinet Association saw more than 100 participants at its recent Eastern Regional meeting in Sherbrooke, Que. “We had a great event,” CKCA Executive Director Sandra Wood said. “We set a new record for a fall regional event with 108 participants from across Canada. And we offered five plant tours, which is a lot for a regional meeting, but our members appreciate the value these tours provide. 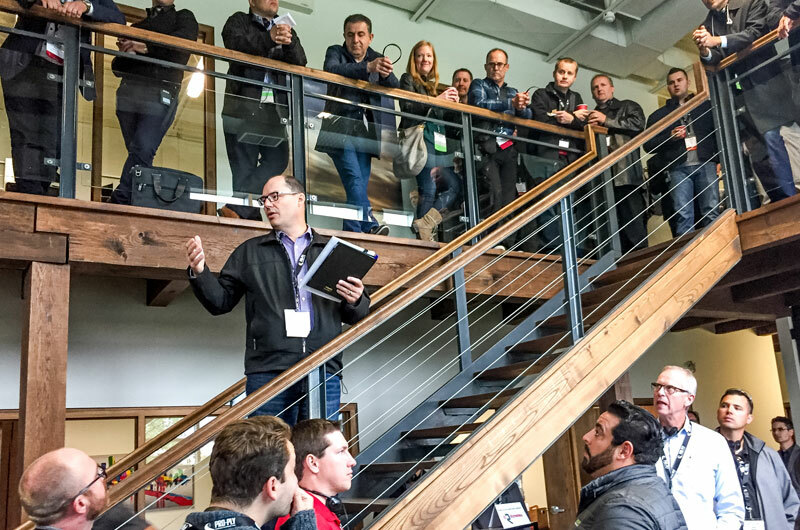 The two-day event, held Sept. 24-25 at the Delta Marriott in Sherbrooke, kicked off with a tour of Fabritec, Canada’s largest kitchen manufacturing facility with one million square feet and more than 700 employees. Employing some of the most advanced manufacturing technology, Fabritec produces 268 kitchens per day. More than 30 years in the business the company maintains a down-to-earth culture founded by the family who started it, Clovis Bourgeouis, now run by his children Jonathan and Nadia. Whether you are a large or small business, there was plenty to see and learn from this innovative manufacturer. Next up was Groupe Lacasse, a North American leader in the design, manufacture and service of high-quality furniture. More than 525 employees create functional, professional workplace environments. Groupe Lacasse is a large and innovative company that produces a wide variety of products for local and international markets. They also have a 10,000 square foot showroom in Chicago, USA. More than 100 attended CKCA's Eastern Regional meeting. Following the tours, the group went back to the hotel to check in and then it was off to Chevreuil for a reception and dinner. Guest speaker Marc Choquette of Dunin Technologie spoke about “Artificial Intelligence – Industry Game Changer.” Choquette told participants that AI is the next revolution in manufacturing and said it is coming fast. AI can transform a business by reducing labour shortages, improving order efficiencies and reducing the waste of overstock. AI can also manage an operation in a way never thought possible so companies can focus on other things. Founded 30 years ago, Dunin Technologie is focused on delivering intelligent software to the kitchen-manufacturing sector. Eric Pothier, director of business development with Richelieu was the breakfast speaker the following day, where he spoke about micro projects, a growing trend that is no longer limited to dense citied such as New York and Toronto. Micro projects are trending in all markets and Pothier said many manufacturers are not yet ready to compete in that area. The third plant tour took members to Interfonction, a manufacturer of custom aluminum and glass doors, who has been in business for more than 25 years. With the increase in metal cabinets in kitchen and bath design, manufacturers need to become familiar with using this material in their manufacturing process. This was an opportunity to see first-hand how metal cabinets are made. 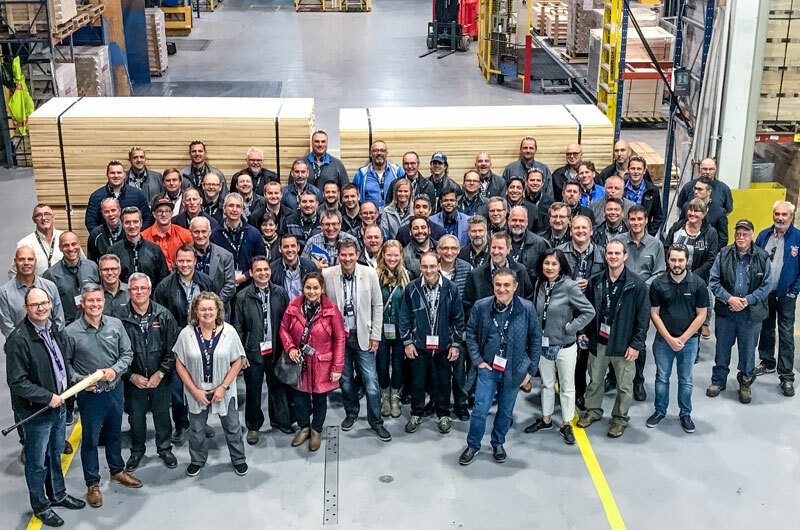 At JM Champeau, a 100-year-old company with 150 employees, tour participants got to experience what it takes to manufacture high quality hardwood components and lumber sold to more than 40 countries. JM Champeau is renowned worldwide for its expertise in the processing and vacuum drying of a wide array of hardwood products: rough lumber, surfaced lumber, ripped to width, moulding blanks and solid or laminated components. It’s sawmill and factories, which use state-of-the-art technology, allow the company to respond to the most stringent industry standards, and its customers benefit from a highly flexible and comprehensive product offering. Lise Compagna, president at Waterville Woodcraft, took one of the groups around. Last but not least was a visit to Waterville Woodcraft Inc., a manufacturer of customized cabinet doors, drawers, table slides and drawer guides. Waterville Woodcraft became the largest North American manufacturer of wooden table slides with the acquisition in 2007 of a major competitor that enjoyed an excellent reputation. Waterville operates a lean and flexible manufacturing plant that is respectful of their team members, suppliers and environment. The next CKCA event is the Ontario Regional Jan. 28-29, 2019 in Barrie, Ont.